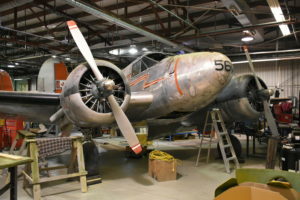 Between 1995 and 2009 the National Air Force Museum of Canada aircraft restoration team completely restored a World War II Halifax Bomber (NA337) which is on permanent display in the museum. On completion of NA337 it was decided to keep the team together and restore additional aircraft with historical significance to the Canadian Air Force. 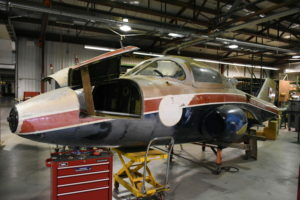 Currently there are two active projects in the restoration shop: the CL-41 Tutor prototype and a Beechcraft CT-128 Expeditor. The Lockheed Hudson Mk VI, that was recently in restoration, is now on hold pending acquisition of parts needed to continue the rebuild. Model # 0001 was one of two Canadair prototypes that led to the creation of the Tutor CT-114.